This twist on the classic French steak-frites is made up of a handful of simple elements that makes for a delicious romantic dinner for two. All parts of the dish are easy to make individually and allow for some preparation so there’s not too much to do when you’re ready to cook/eat. Start by making the herb butter, which will keep in the fridge for several days (so can be made well in advance). The butter needs to be soft to make this, so leave it out at room temperature for a couple of hours to soften or pop in the microwave for 10 – 20 seconds, but do not let it melt! Finely grate the garlic and add to the butter with the chives and parsley. Mix together well, then shape into a cylindrical shape, so that you can easily cut into slices to serve on the steak as you need it. Set aside in the fridge until ready to use. 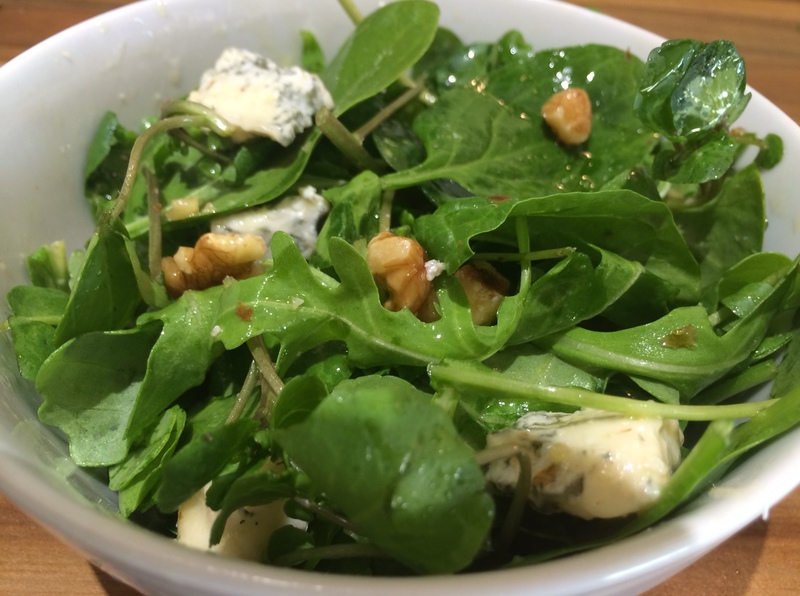 For the salad, in a serving bowl, add the designer leaves, walnut pieces and gorgonzola. In a separate small bowl, make the dressing. We use shot glasses as units of measure as these seem to be more prevalent in kitchens than actual measuring devices. You’ll need a quarter of a shot of white wine vinegar and half a shot of olive oil (extra virgin if you have it) and a pinch of salt. Set both aside until you’re ready to serve, then give the dressing a quick stir, pour over the salad and toss. It’s advisable to not actually cook the steak and gnocchi until your date gets here as they don’t take long and you don’t want them to go cold. When you’re ready, for the gnocchi, start by adding 1½ tablespoons of olive oil to a large frying pan over a medium heat. Then tip in the gnocchi with a good pinch of salt, a couple of twists of pepper and the rosemary. Turn the heat down slightly, and turn the gnocchi every couple of minutes so that each side becomes golden brown. Meanwhile, whilst the gnocchi is on the go, put a griddle pan over a medium-high heat leaving to heat up. Give your steaks a rub with a little olive oil on either side and give a good seasoning of salt and pepper. It is always best to oil the meat rather than the griddle else you’ll just end up with a load of smoke in the kitchen (which is never a good look). 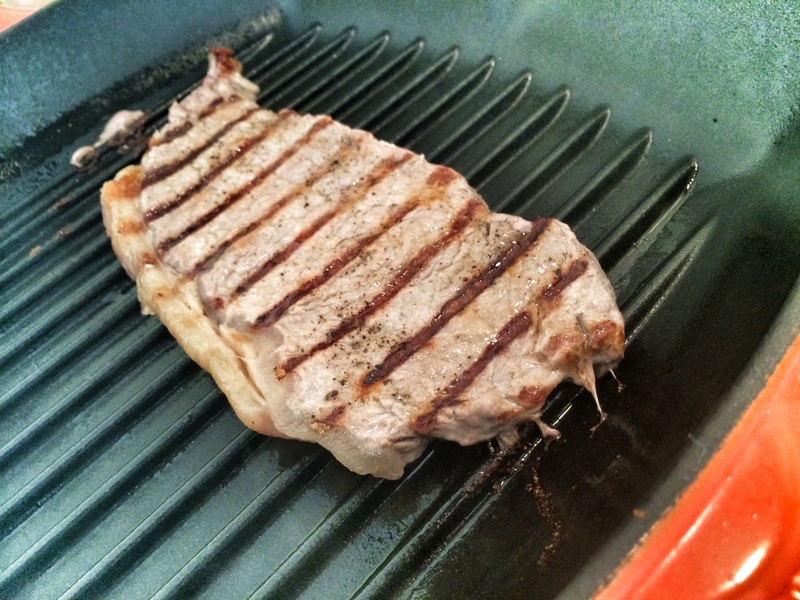 Once the griddle is hot, cook the steak for a couple of minutes on each side depending on how you like it. If you steak is cooked before the gnocchi, wrap it in tin foil, which will allow it to rest and become even more tender without drying out. 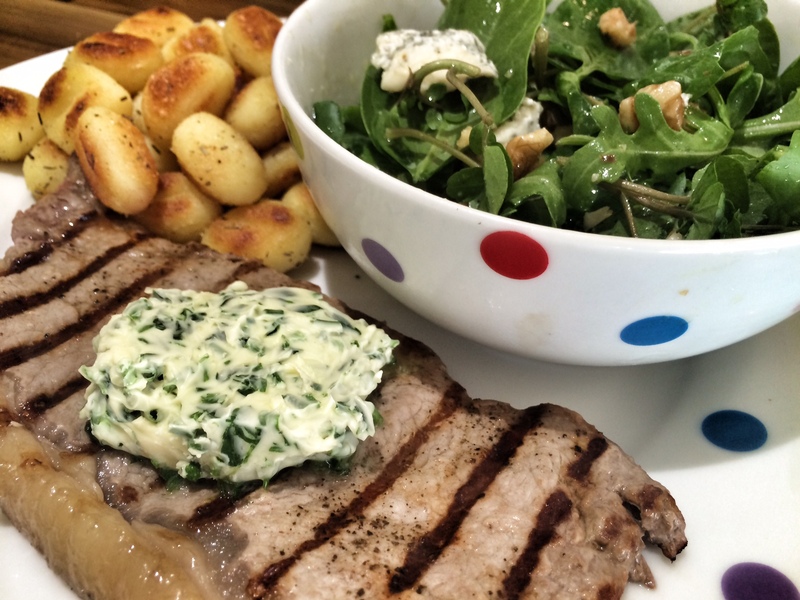 Now you’re ready to serve: a steak each with a slice of the herb butter on top, a couple of spoonfuls of gnocchi and a some of that freshly tossed salad. With a glass of red wine to hand, this can never be a bad meal, whether for your long-term partner, date or even just yourself if you’re feeling particularly indulgent! 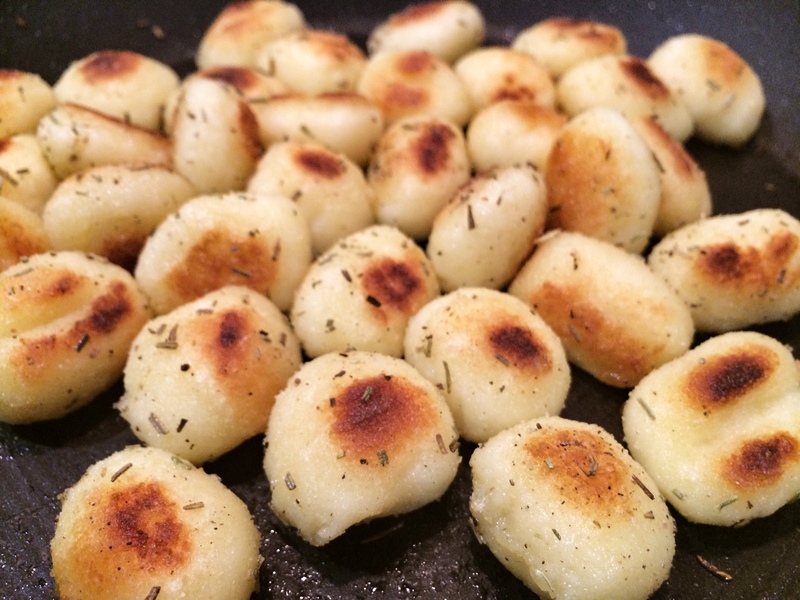 That gnocchi looks really good – I love to fry it! Great alternative to roast or fried potatoes!